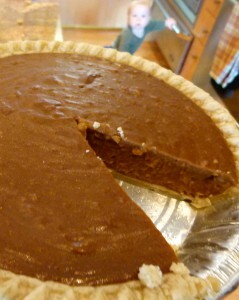 My Dad speaks fondly of the Butterscotch Pie that his Mom used to make him. I have tried to recreate many of his favorite childhood recipes (remember the Triple Decker Caramel cake? Recipe here) and this is another try to make his childhood memories come true. It turns out that this is a much more sophisticated version than his Mom made (he suspects she used a pudding mix for the filling!) and, as adults, is more rewarding. The browned butter gives this a deeper taste. The filling is not very sweet so on first bite, it doesn’t seem like a winner. Take the second bite. You’ll be surprised at how addicting this recipe is. 1. Melt butter in heavy skillet over low heat. Watch carefully. When butter turns golden brown and separates into solids and oil (this is called ‘browning the butter’ and it adds a delicious, complex, nutty, musky, sophisticated nuance to desserts), add brown sugar; cook, stirring constantly, until mixture comes to a boil. Make sure there’s enough head space in the pan to ensure nothing boils over. Stir in water and remove from heat. 2. In a seperate saucepan, mix cornstarch, flour and salt. Blend in milk, stirring until smooth. Stir in brown sugar mixture. Cook over medium heat, stirring constantly, until mixture comes to a boil. Boil 1 minute longer. Remove from heat. 3. 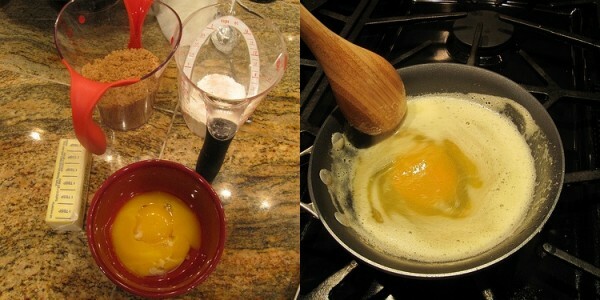 Stir a little of the hot mixture into the egg yolks; then blend into hot mixture. Boil 1 minute. Remove from heat. Add vanilla. This thickened up quickly for me. Be ready to pour it into your prepared pie crust. 4. 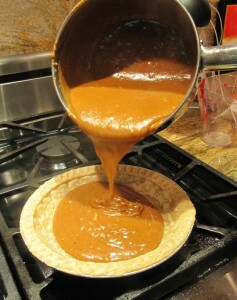 Pour into pre-baked pie shell. If you want to make a meringue, top with meringue while filling is hot. I did not do a meringue topping and it was wonderful without. 5. Let it cool, in the fridge, before serving. Do you have any Butterscotch Pie Recipes that I can try to make all my Dad’s nostalgic food dreams come true? I’d love to know about them. I’m sure that with enough (eh hem) research, we’ll find that pie. And if we don’t? The research is sure delicious! I’m going to have to try this one. My son absolutely loves pie! Any pie….. with or without ice cream, he dreams of pie. We have birthday pie not cake for his birthday even. That kid can eat the whole thing if I let him, so it’s a good thing he needs the extra calories. Well he does usually eat the whole thing or at least most of it but over the span of a couple of days. I usually just sneak a bite to get a taste but that’s it since I don’t need those extra calories. YUM! Thank you for the recipe. Definitely going to give this one a try! Great recipe – loved the little glimpse of your chief assistant who looks like he’s getting ready to open the oven for you!! 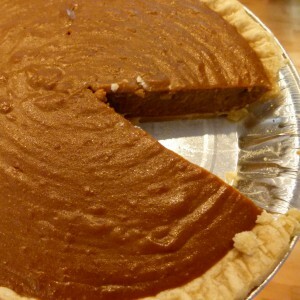 I’m not normally a butterscotch fan, but the picture of that pie did make me drool. Oh, and a gluten free pie crust to go with it ofcourse! I have a bag of gluten free flour on hand for making gluten free pie crusts, so I should not even need to visit the store for this one. Thanks for the recipe and directions. It looks delicious! This pie looks yummy! I may have to give this a try someday. Thanks for sharing your recipe, Anne-Marie! My parents are here visiting from Virginia. My father LOVES butterscotch pie! We used to eat a lot of Sunday lunches when I was little and the waitresses would make sure there was fresh butterscotch pie for Daddy. They fixed theirs with meringue on top. I need to try your recipe while he’s here. Thanks!